We offer quality products, top-notch service and competitive prices. We service all areas of Northeast Florida. Searching for Jacksonville ready-mix concrete dealers? Look no further! We deliver ready mix to commercial and residential sites. Contact us to order. Hard-Rock Materials, Inc. of Florida produces and sells concrete ready mix. 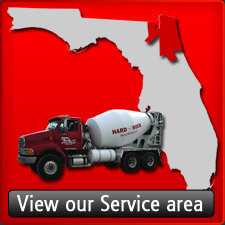 With our growing fleet of concrete mixing trucks, we deliver to all areas in Northeast Florida, including Jacksonville, Orange Park, Green Cove Springs, Middleburg, Baldwin, St. Augustine, Keystone Heights, and Palatka. Our concrete production facilities are in Green Cove Springs and Baldwin.